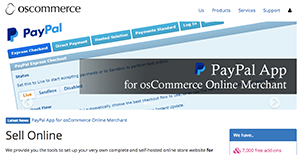 osCommerce is a simple and a straightforward e-commerce and online store-management software that can be installed on any website that has PHP and MySQL installed. It is available as a free platform under the GNU General Public License. osCommerce is truly an open source program that is worked on continuously by thousands of developers. More than 260,000 different stores are currently operating through the osCommerce platform. Support for the program is mostly found through its rich online community where users and developers converge for ideas, complaints, solutions, and suggestions. There are a number of benefits that comes with the osCommerce platform. For one, it is a robust e-commerce and online store-management software program that can be integrated on any website or web server that has PHP and MySQL installed. On top of being a very flexible e-commerce solution, osCommerce is a free software under the GNU General Public License. That means you are not paying for anything, which means quite a lot if you are small startup that does not have the funds to invest in a pricey eCommerce setup. osCommerce provides users a set of tools that enable them build a complete and self-hosted online store for free. The system also offers users complete access to and total control of your online store and data. Developed by a vast community of people over the past 16 years, osCommerce is fueled by individuals who are passionate about what they do and that is to give businesses a powerful eCommerce application. The osCommerce community has uploaded over 7,000 add-ons that can be implemented without any cost, allowing users to get the most out of the osCommerce platform without shelling out money. As an open source application, osCommerce is committed to the continued development of its product and aims to foster a strong and expanding international community engaged in their achievements. If you are considering osCommerce it could also be a good idea to investigate other subcategories of Best Shopping Cart Software gathered in our base of B2B software reviews. Each company has its own characteristics, and may require a special Shopping Cart Software solution that will be adjusted to their business size, type of customers and employees and even specific niche they deal with. It's not wise to count on finding an ideal software that will work for every company regardless of their history is. It may be a good idea to read a few osCommerce reviews first and even then you should keep in mind what the service is supposed to do for your company and your workers. Do you need an easy and intuitive solution with just elementary features? Will you actually make use of the advanced tools needed by pros and big enterprises? Are there any specific tools that are especially beneficial for the industry you operate in? If you ask yourself these questions it will be much easier to find a trustworthy solution that will match your budget. How Much Does osCommerce Cost? We realize that when you make a decision to buy Shopping Cart Software it’s important not only to see how experts evaluate it in their reviews, but also to find out if the real people and companies that buy it are actually satisfied with the product. That’s why we’ve created our behavior-based Customer Satisfaction Algorithm™ that gathers customer reviews, comments and osCommerce reviews across a wide range of social media sites. The data is then presented in an easy to digest form showing how many people had positive and negative experience with osCommerce. With that information at hand you should be equipped to make an informed buying decision that you won’t regret. What are osCommerce pricing details? What integrations are available for osCommerce? If you need more information about osCommerce or you simply have a question let us know what you need and we’ll forward your request directly to the vendor.